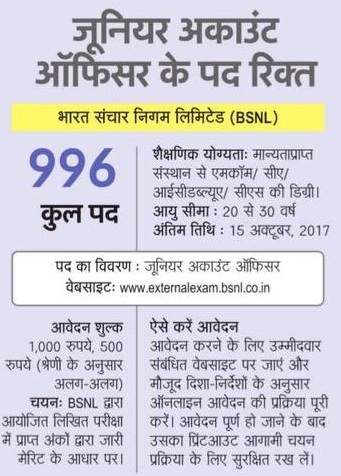 BSNL Recruitment 2017 996 Junior Accounts Officer Posts will be filled in circle of Bharat Sanchar Nigam. To apply online there is official website which takes your personal data along with application for BSNL JAO. A good news comes on 9 September for commerce fields who students who involve in fields Chartered accountant. They may have good career in BSNL Govt. Selection Process: On all zone of BSNL online competitive examination will be held. Age Limit: Candidate age shall not be below 20 years and should not exceed 30 years as on 1st January 2017. upper age limit relaxation is allowed for SC ST OBC. Pay Scale : Salary of JAO (Junior Accounts Officer Telecom) in BSNL appointed in the IDA pay scale Executive [E-1] of Rs.16,400 – 40,500/- with annual increment @ 3% of basic pay plus. Educational Qualification as on 1st Jan 2017: If you are background from the fields of M.COM, CA, ICWA, CS and having degree in M.COM/CA/ICWA/CS from recognized board then you is eligible. Application Fee : The Application Fees will be accepted from 11 September. For Gen/OBC candidates Rs.1000/- and for SC/ST candidates Rs.500/- (Rupees Five Hundred only shall be paid through online mode i.e. Internet Banking, Credit Card, Debit Card only. How to Apply : To apply in Bharat Sanchar Nigam Ltd. 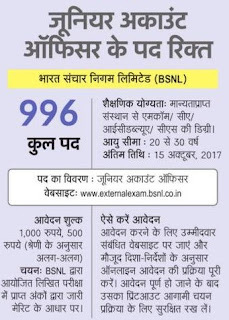 Interested and Eligible persons should provide extenuation information by filling applications in website www.externalexam.bsnl.co.in before 15 October 2017.